This is what I had seen in June and what I expected to be formed. …but sometimes the waves within them are too volatile to be worth the risk. Right now I am waiting on the right signals to trade this EURO but so far it looks as if I might have to forgo it. Trading within them can be done several times until the breakout takes place which will offer even greater profit potential. Thanks for the analysis! Very informative. My current strategy (forward testing on demo) is identifying S/R and recent trends on daily charts, and using price action signals on 4 hour charts to enter with the trend as a pullback to the trend line is seen. I’m not currently trying to trade breakouts, but I am keeping an eye on the subject and studying them to possibly trade them in the future. 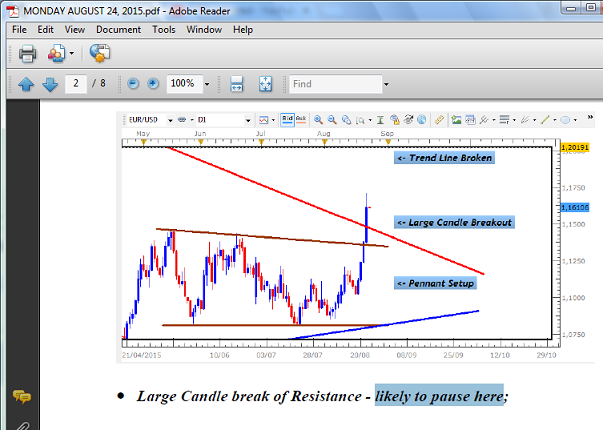 Support and Resistance can be good tools…if you catch the best ones you can definitely get Pips from them. Problem I always had was knowing whcih of them would be strong enough and how many Pips I could get from them. Another issue was how far to place the Stop Loss since some S/R required only 10 Pips while some required 50 Pips…was difficult to create a strategy based on these moving parts. What are your targets and Stop Losses? Breakouts are very powerful setups, and once you analyze and trade them correctly with the right strategy, they can be a good weapon in your arsenal. Yep I ran into the same issues with support and resistance early in my studies. Now I only mark really obvious ones, especially if they coincide with a psychological level. I’ve found trend lines to be much better indications of where price is likely to reverse, so S/R only come into play when I’m setting stops and targets to determine if the trade is too risky. I’ve been setting my orders with a 1:1 risk-reward, first setting my stop at a logical point below the trend line (for longs) or above the trend line (for shorts), then ensuring that my target seems logically reachable. Lately I have been moving my stop along the trend line to reduce my risk while still allowing for price to bounce in my favor. I still have a ways to go before I understand even half of this stuff, but these videos are brilliant! I really appreciate the way you go through these trading situations and fully illustrate the concepts with multiple examples and show the varied opportunities involved in these situations. Cheers!! How´s the trading going and what strategy you use? 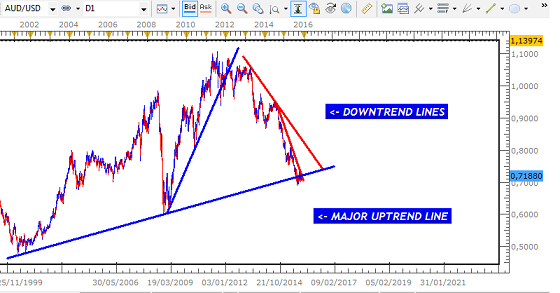 Yes, Trend Lines are good Stop Loss areas/better than S/R once the trend is going to continue. Why only 1;1? you shouldnt be aiming to get Profits equivalent to Losses. Aim Higher. This will give you a cushion for losses. What determines your targets now for this 1;1 ratio? it sounds as if its not clearly defined as yet and that it changes along the way. Ideally, targets should set based on a firm set of rules. 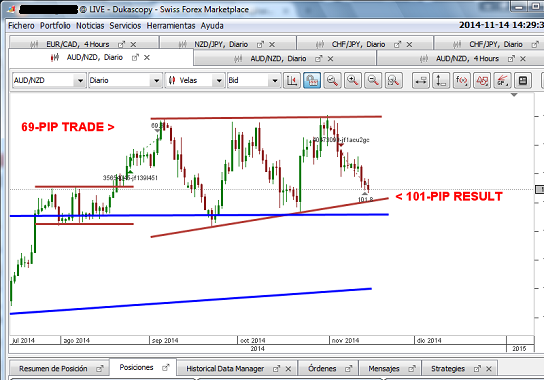 It is true that the actual number of pips can vary depending on what the market offers. But the reason for choosing a target should be based on a firm set of criteria. This is because these Large Candles, as attractive as they are, hardly lead to successful breakouts. I cant tell how much money was lost and time spent in spotting the right signals to trade- made a big difference in results. 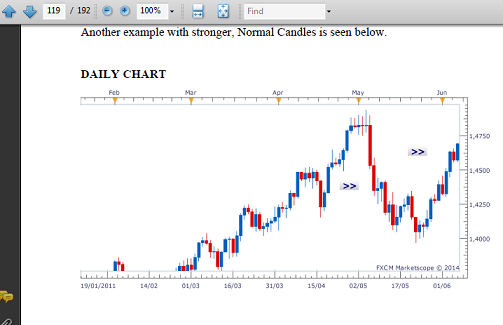 Although this has taken place on the Daily Chart, these Large Candles are seen across all time frames as well. 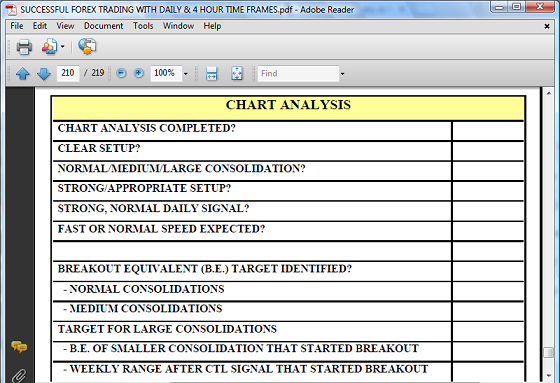 Its not so much the size in terms of Pips but relative to the other Candles on the time frame being traded. So whether you are a Day or Swing Trader, they will appear from time to time. Once you can make this distinction, it becomes much easier to avoid these traps. 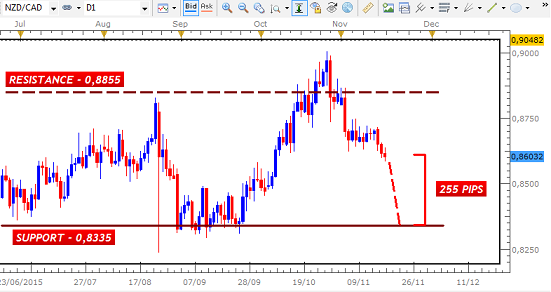 Range Trading opportunity on the NZD CAD. 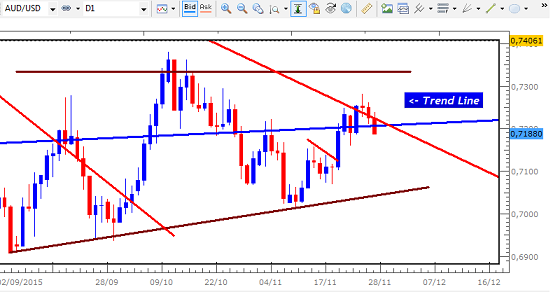 Its now at the Resistance boundary and could be headed back down with a break of the 4H Chart Trend Line. The key is the type of signal that we get to start the move. 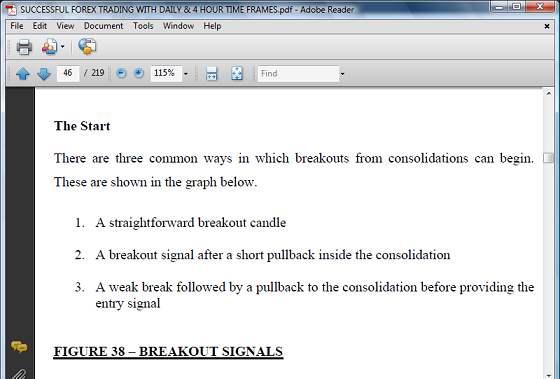 Both the Candlestick Setup and the Breakout Signal that starts the move have to be strong - otherwise, gonna be risky. 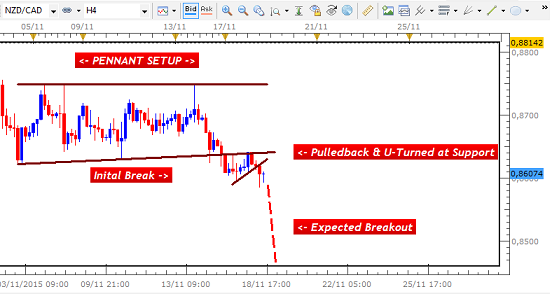 The Setup and the Signal may appear within the next 12 hours and could offer 150 Pips. Following up on the previous analysis, we`re now seeing the pair showing signs of starting a reversal. Strong Bearish Signal given at Resistance, but not enough to start the move. We gonna need either an ABC or Bear Crown/head and shoulders pattern to get going. Hey all, been awhile, back with you. These Videos will now show you examples of a more aggressive Swing Trading approach based on my current Methodology. They will show how you can take advantage of profitable movements in the market each week that can provide an average of 150 Pips per trade. As long as you know which trading rule to apply to the trading opportunity presented, you will be able to profit from these trades on a consistent basis every month. 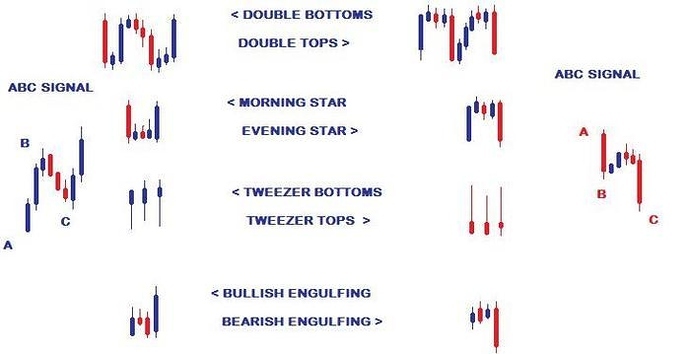 There are now 5 Swing Trading Strategies that I use which will be showcased here which you can easily apply to your trading. As Swing Traders using Price Action/Candlestick Signals, a big challenge when Trading within Consolidations is figuring out which time frame to use for entry or if we should simply enter at the S/R areas. There are several Technical Factors that determine which strategy to use but one of them has to do with the size of the Consolidation. For small ones such as in the Video below, volatility at the S&R areas is minimal, making it easier for us to enter there without waiting on the Candlestick Signals. For larger Consolidations, however, Daily and 4 Hour Chart Signals have to be used given the increased volatility/spikes at these areas. There are some Trends and Consolidation Breakouts that are very fast and are characterized by Strong, Large Candles while others have Small, Slow Candles. These require 2 Types of Trading Strategies to ensure we aren’t affected by unexpected pullbacks that lead to losses. These Trades will also be shown in the Dukascopy Trader Contest to show how they perform under a competitive environment. By targeting an average of 150 Pips per trade twice a week, it is possible to generate 1200 Pips each month - very large turnover that can provide strong Short Term and Long-Term Gains. Any questions and comments, fire away. There is nothing more frustrating than seeing a strong floating profit turn into a loss in a matter of minutes. This can be avoided by establishing and obeying a rule for how long you hold your trades before deciding to close them. Sticking to this rule will help to minimize the losses due to holding out for more Pips than the market is going to give us. This recent trade on the GBP CAD which had to be closed at the end of my Holding Period for this type of trade shows how crucial this rule is to trading success. Once you obey this rule, consistent gains will be a regular part of your trading. After forming the Pennant Setup on its Daily Chart as predicted several weeks ago, this pair could provide us with a trade in the next couple of days. We will either see it head back inside of the Pennant and take us to Resistance or U-Turn at Support to continue the Bearish Breakout. If it gives a Bull Candle to start the reversal, it would be an ABC Signal, which as you know leads to Sharp Movements and is a common signal seen when it comes to False Breakouts. If it continues bearish however, it would have to give us a strong Bear Candle that breaks the Counter Trend Line just below Support. Many times when a Consolidation is being broken, we will see the pair breakout initially, then pullback to test the broken S/R before U-Turning. Once we get a signal in either direction, we are likely to be able to capture at least 150 Pips as long as the setup we see on the Daily & 4H Charts meet our entry rules. So by Wednesday the latest we should see a signal to get things going. Get ready to trade it! 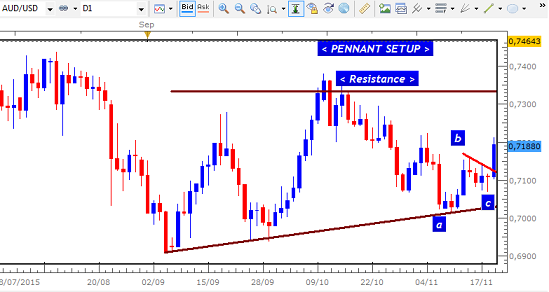 We have a scenario now on the GBP USD where the Support of its Pennant on the Daily Chart is now taking place. Based on the theory of Consolidations, it could either continue Bearish or reverse to take us back inside of the Pennant. 1- Jumping into the market at the first sign of a break of the Pennant only to see the market reverse sharply back inside. 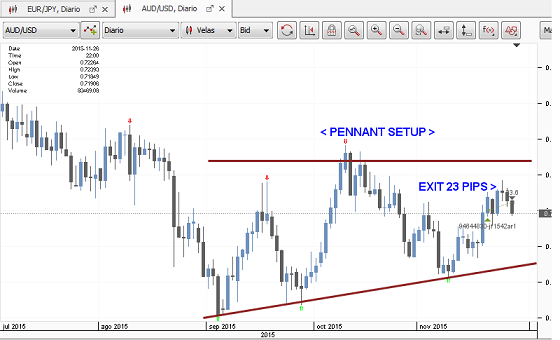 2 - Start trading when we see the market showing signs of heading back inside of the Pennant only to see it U-Turn sharply to continue the breakout. Both cause losses on a regular basis for traders, but they can be minimized once we know what those factors are that predict which situation will be the correct one. From here, it will either continue lower in favour of the USD or reverse to head back inside the Pennant. 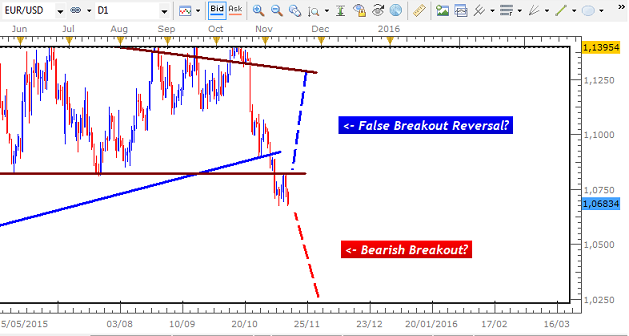 Ultimate direction is going to depend on the signal we get on the Daily Chart - either way, it will be very profitable as breakouts from Consolidations and False Breakout Reversals are usually fast, providing large Pips in a short time. NZD CAD is the focus today. With some 255 Pips on offer until hits Support, a strong signal to get things going would offer a short trading opportunity. As you can see, there was an intitial breakout followed by a pull back to test the Support. 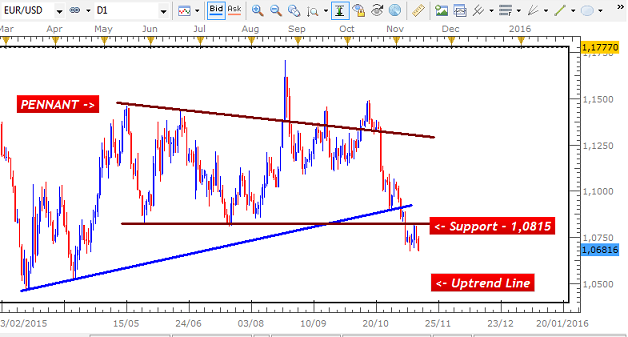 Having now U-Turned, it could continue bearish until that Support boundary of the Range is hit. The key thing now is to wait for the right type of Signal from the Daily Chart. Take a Top - Down Approach. 7 . Then use this $100 along with the risk per trade (ex. 5%) to determine the Risk/Reward Ratio per trade you need. Naturally, as your account balance increases/decreases, the dollar amount of the gain per trade will change. This approach takes the uncertainty out of how many Pips to get per trade since you now know the bigger picture. The challenge is then to determine which trading strategy can get you this consistently. November was the first month of testing additional Swing Trading Strategies that are the more aggressive versions of the current Methodology I now use/shown in this thread. Combined, the trades made provided a Return of 19% from just 5 trades with most coming from Consolidation Setups. All follow a certain set of rules based on the setup seen and were not random trades made. 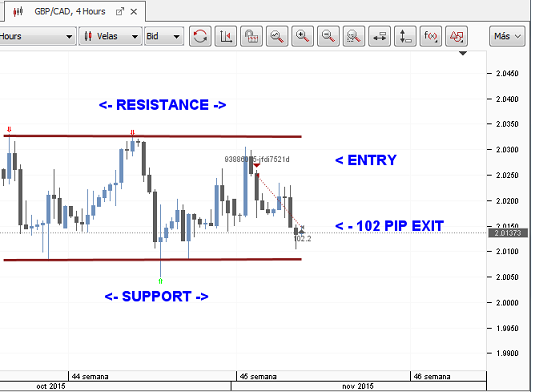 These strategies target 150 Pips per trade on average (100 to 200 Pips) as they take advantage of Weekly Range movements across the currency market each week. On average, there are 8 of these moves that take place every month. So if you aimed to capture just 2 of these each week, you will be able to generate Large Rates of Return on your Account each month. 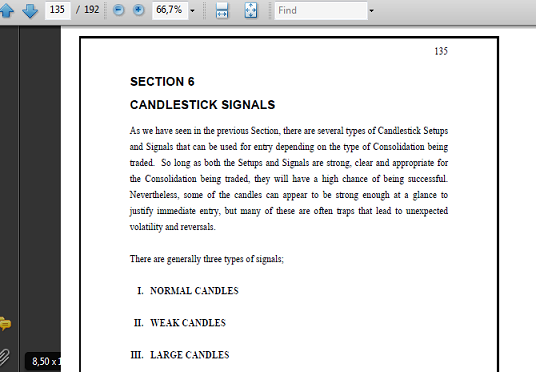 FXCM Charts are used to identify Candlestick Signals as FXCM uses the New York Close of the Daily Candle. On November 2, having determined that the setup and signals on the Daily and 4 Hour Charts were in sync with the criteria for this strategy, a short position was opened just below Resistance. The target was set to the Support boundary for a planned gain of 120 Pips but was exited for a gain of 102 Pips as the market had not yet hit that target by the end of the established holding period. As can be seen in the Video, the decision to exit instead holding out for the extra 20 Pips was the correct one. With this Swing Trading Methodology, you have to obey the rules related to the length of time that we remain in a trade. This helps to keep your trading objective so that your temptation to capture additional Pips does not compromise your success and long-term profitability. 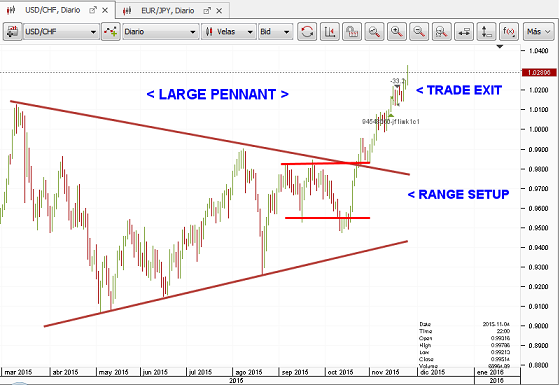 This trade attempted to take advantage of the breakout from a large Consolidation Pennant Setup on the Daily Chart on November 17. 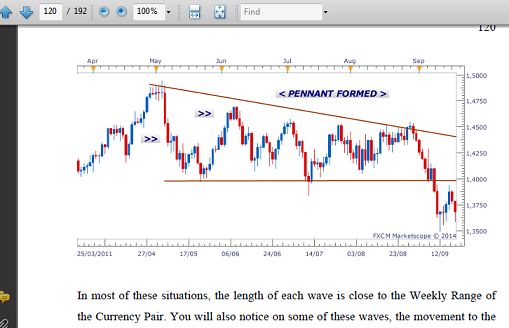 The breakout took place at the Resistance boundary and was expected to continue higher as the Uptrend became stronger. 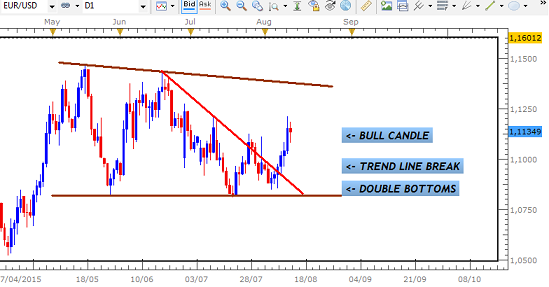 The target for this trade was set to the Breakout Equivalent of the Range Setup that started the overall breakout. This B.E. area was at the 1,0350 area and would have provided a gain of 190 Pips. The Breakout Equivalent is the area I have identified as where breakouts from Consolidations head to before pulling back. This helps in eliminating the uncertainty of where to exit our trades during the fast but tricky moves. However, it was later realized that the Breakout Equivalent of the 4 Hour Chart’s Range was at the 1,0200 area and would have led to a pullback - customary at these areas - before that 1,0350 target was reached. Despite the fact that the market was expected to continue higher after this pullback, it was uncertain whether or not it would now do so within the holding period and without taking out the Stop Loss. This led to the reluctant but necessary decision to exit for the small loss. Mistakes and oversights like these take place from time to time and are par for the course. The key is to ensure that they are not repeated and that we meticulously analyze all aspects of the time frames before trading. In this trade on November 19, the Daily Chart had provided us with a strong bullish ABC Signal above the Support of the Pennant to start heading back to Resistance at 0,7310. Based on the characteristics of this setup, the Daily Chart was needed to give us the signal to trade instead of the 4 Hour Chart or entering at the Support boundary. 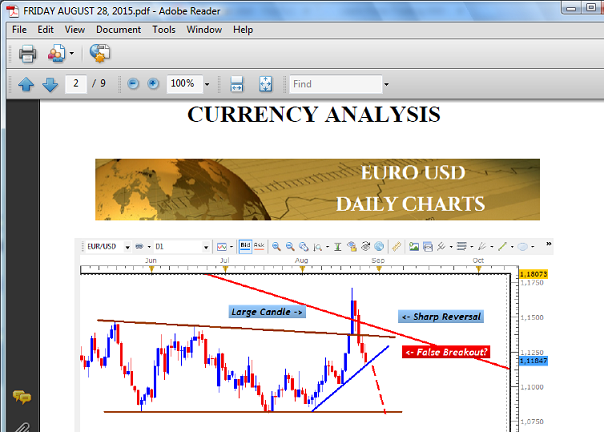 ABC signals are among those that lead to very fast breakouts across the currency market. 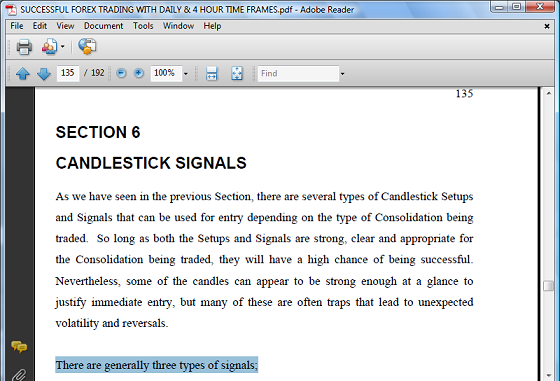 Once spotted and traded, these signals tend to provide hundreds of Pips in gains within a very short period of time. 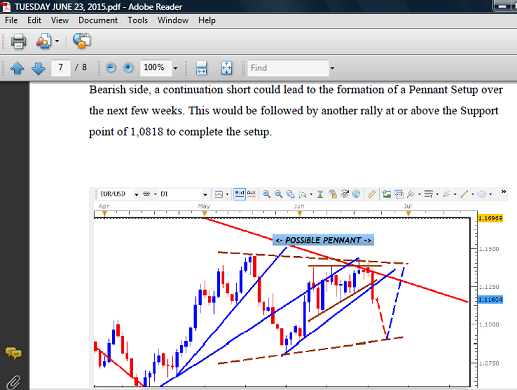 Given this strong ABC Signal, therefore, this trade was expected to hit the target unhindered. However, by the end of the holding period, the trade had to be closed as the pair began to stall at one of the Downtrend Line that has defined the bearish direction of this pair. This trade was another example of the importance of closing trades early once the holding period has expired. A small gain of 23 Pips is always better than a loss and as you can see from the pullback that has started, this is what is likely to have taken place in the days ahead.